Depending on where you live, beach season is here or just around the corner, which means it’s time to get busy relaxing and perfecting your beach look. After all, the last things you want to worry about are getting sunburned or your makeup not working well in the heat—there’s way too much fun to be had. Fortunately, with a few makeup and skincare tips, you can achieve a nice, healthy glow on any beach day. When it comes to your eyes, you don’t want to rock the raccoon look at the beach. Waterproof eyeliner is amazing because it is designed to stay put under oily, sweaty, or wet conditions. Look for a nourishing formula packed with ingredients meant to condition the eyelids, such as jojoba oil, hyaluronic acid, and ceramides. 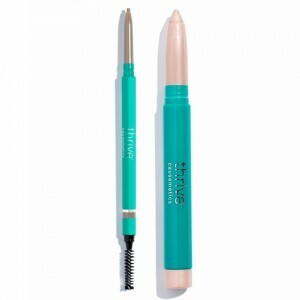 Also opt for a high-quality, water resistant tubing mascara that won’t clump, flake, or smear. With a tubing mascara, you get the look of faux lashes without the glue. It’s probably unnecessary to wear foundation to the beach, especially when you can use a buildable CC cream with built-in SPF 35 that also doubles as a tinted moisturizer. Choose a gentle, skin-loving formula with vitamin C to provide anti-aging benefits and flaxseed extract to absorb oils and reduce shine. Look for a broad spectrum formula to protect against harmful UVA and UVB rays. By simply applying a CC cream with these attributes and building it up until you get your desired coverage you’ll be able to cut out multiple products. Wearing lipstick to the beach might be up for debate among some, but if you’re feeling it, you should do it. You could choose a product that enhances your natural lip color, or you could outline and fill in your lips with a long-wearing, plumping lip liner. If you’re taking the latter route, just be sure the products you use provide hydrating color that’s feather and fade-proof. If you’re opting for a lip stain, don’t forget to add a balm with broad spectrum SPF over the top. After all, your lips need as much protection from UVA and UVB rays as the rest of your face and body. You don’t want a blush or bronzed look that’s too contoured or overdone for the beach. Go with a bronzer or peach-colored blush and lightly apply it to the apples of your cheeks and work outward. You could also use a cheek tint or a cream instead of a powder. No matter what you decide to do with your makeup, you should feel comfortable in your own skin and ready to take on your beach day. Let your inner beach goddess out for the day. And don’t forget the sunscreen!